My name is Pamela, and I’m a figure skating junkie. Or used to be. I first started taking notice of the sport at the 1980 Winter Olympics at Lake Placid, when pairs skaters and reigning world champions Tai Babilonia and Randy Gardner were forced to withdraw from competition because of his groin injury. Disappointing as that was to see (and devastating for B&G themselves), I ended up sticking around for the other disciplines. My most vivid memory after their withdrawal was watching lean, elegant Robin Cousins–one of the tallest men in the sport–win the men’s gold for Great Britain, and two young American up-and-comers David Santee and Scott Hamilton place fourth and fifth. And just like that, I was hooked. I followed the sport faithfully after that, watching Hamilton fulfill his early promise with four world championships and a gold medal in Sarajevo, 1984. After that, I watched two amazingly talented, closely matched male skaters–one American, one Canadian, both named Brian–vie for dominance in the sport over the next four years, a competition finally resolved by a narrow victory for the American Brian [Boitano] over the Canadian Brian [Orser] at the 1988 Olympics in Calgary. (By the way, “Battle of the Brians” = “Best Skating Rivalry Ever”). 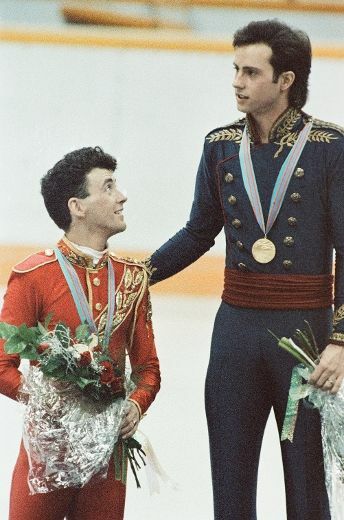 And I was thrilled when perennial long shot Paul Wylie won a silver medal at the Albertville Games in 1992, skating beautifully to a program set to Patrick Doyle’s “Henry V,” one of my all-time favorite soundtracks. The 1992 Games swept Kristi Yamaguchi (gold) and Nancy Kerrigan (bronze) to fame, then two years later, all hell broke loose with an attack on Kerrigan (front-runner for the gold at Lillehammer) orchestrated by the ex-husband of her U.S. rival Tonya Harding. The fallout from that ugly incident lasted for years, but fortunately, a fresh crop of skaters, led by the phenomenal Michelle Kwan, took away some of the lingering bad taste. Ultimately, Olympic gold was not in the stars for Kwan, and I winced every time it slipped away from her. But nine national titles, five world titles, and Olympic silver and bronze medals still represent one hell of a legacy, and she’s rightly considered one of the all-time greats. Pairs and ice-dancing weren’t on my radar to the same degree as the singles events. But I watched slack-jawed with the rest of the world when Torvill and Dean essentially revolutionized ice-dancing with “Bolero” in 1984. And scratched my head over some of the routines that emerged in the post-T&D era. More than the other disciplines, ice dancing seems prone to frequent reinvention–the pendulum is constantly swinging, though you can’t always predict in which direction! Over the last decade or so, my interest in figure skating has waned, mostly due to decreased coverage of the sport, an increasingly incomprehensible scoring/judging system, and the relative lack of strong skaters to emerge from the ranks, once the “veterans” retire or turn pro. But in spite of all that, once that Olympic torch is lit and the ice rink properly Zambonied, I’m there again–ready to marvel at the skaters’ ability and tenacity, laugh at the sillier costumes and programs, question the judges’ sanity, and applaud or criticize the results. And the Sochi Games of 2014 provided plenty of the above. From the introduction of the new team competition, to the resurgence of the Russian pairs skaters, to the cringe-inducing splat-fest that was the men’s free skate, to the well-deserved Olympic coronation of ice dancing favorites Davis and White, to the highly controversial outcome of the women’s competition, figure skating once again provided two weeks of fascinating, on-the-edge-of-your-seat drama. Tonight, after “16 Days of Glory,” the Olympic torch goes out. See you in four years! This day, which might enflame thyself, old Valentine. Ends of much wonder ; and be thou those ends. May all men date records from this day, Valentine. Nor things, which are but one, can disunite. Besides this bishop’s knot, of Bishop Valentine. Longer to-day than other days ? Stays he new light from these to get ? And finding here such stars, is loth to set ? So slowly paced in this procession ? And be to others spectacle, and talk ? A night as well as day, to thee, old Valentine ? So nicely about the bride ? As souls from bodies steal, and are not spied. But now she’s laid ; what though she be ? Yet there are more delays, for where is he ? First her sheets, then her arms, then anywhere. Neither desires to be spared nor to spare. No such occasion to be liberal. Than all thy turtles have and sparrows, Valentine. There’s but one phoenix still, as was before. Only desired because your face we see. 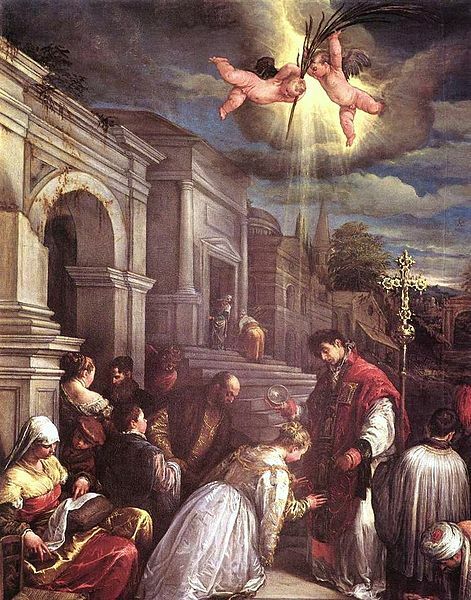 Till which hour, we thy day enlarge, O Valentine.